My name is Paula and my son is called Valentín. We spent his first 11 months of life going to and fro many different hospitals in our country (Spain). Valentín seemed to be born as a healthy baby. However after spending one hour eating with a strange-eagerness, he felt asleep in my arms. I soon noticed changes in his body temperature. He felt cold. Something was wrong. A slight tremor then began in his left hand. I called the nurse several times but at the time she came into the room, she noticed nothing, so she urged me to sleep and to let Valentín rest. I could not rest. The tremor started again; at that time his left hand and one of his feet was trembling. He felt cold and his skin was starting to turn blue. Then his face started to quiver. Even more, his little wrinkles and the corners of his mouth were highly marked in white color. This time I urged my husband to rush to the hospital corridor to seek urgent help. When the nurse came and saw my son, she quickly took him up and left the room immediately. Valentín was barely breathing. The tremors turned out to be seizures. My son was admitted to the Intensive-Care Unit. At 5 hours of birth, Valentín was almost dying. On-duty doctors put him on oxygen and managed to avoid the coma. The first sugar check showed that Valentín’s blood glucose was 8 mg/dl (0.44 mmol/L). However, the glucose level was initially undetectable. Hours passed and his blood glucose still wasn’t in the normal range. Doctors performed all possible metabolic tests, however results would take many days to arrive, almost a month. After 48 hours, the severity of the situation started to decrease, but the blood glucose remained at very low limits (we barely managed to keep them close to 40 mg/dl, 2.22 mmol/L). He did not respond to the first glucagon test. He did to the second one. For the first time, his father and I heard the words that we would hear every day and for many months: “Congenital Hyperinsulinism.” Doctors began to treat my son with Diazoxide. After 3 days, the medical staff concluded that he wasn’t responsive to that treatment. They tried then with Octreotide, for many days Valentín’s blood glucose remained between 40 and 60 mg/dl (2.22 and 3.33 mmol/L). The first results of the metabolic tests came and they didn’t show alterations. Enteral nutrition by nasogastric tube started. I’m very grateful with the endocrinologist who was in charge of Valentín’s case, because she found a place (University of Exeter Medical School) were we could had the genetic testing done in only 21 days. Thanks, THANKS! (And I’ll keep on thanking every single day!). Two months after birth, Valentín was finally diagnosed with congenital hyperinsulinism. The result showed a focal form, so there was a possibility of healing. Valentín’s HI was really hard to control, so we were transferred to the Clinic Hospital of Navarre, which was the only center performing the one PET-Scan with 18F-fluoro-L-Dopa in Spain at that moment. 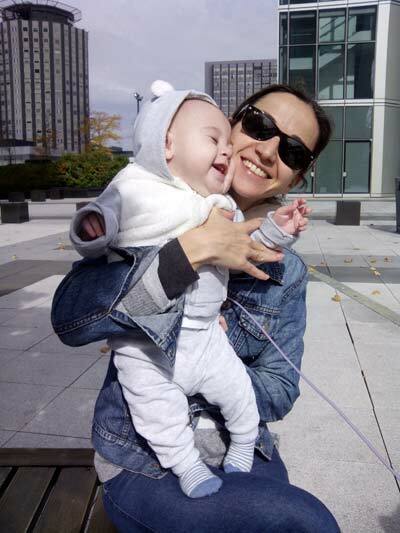 At 4 months of life, we were transferred to La Paz Hospital in Madrid, where Valentín had successful surgery. However, one month after the surgery, Valentín was admitted again in the hospital with a glycose level of 50 mg/dl (2.78 mmol/L). The glucagon test confirmed the worst possibility. He was hyperinsulinemic again. The endocrinologist who was in charge of Valentín attended an international congress where she found some reference doctors, as well as the surgeon who had performed the pancreatectomy, and they decided to go for another PET Scan. It confirmed our worst worries. There was another focal lesion, or maybe the previous one had replicated. This time, the surgery was even more important. Glucose levels began to be normal again after the surgery, but Valentín was still experiencing pain and vomiting. A month after the surgery we had some imaging-tests that confirmed there was no obstruction, yet, the pain was increasing. The inability to feed him forced us to continue parenteral nutrition. After having many medical sessions in one of the best hospitals in Spain, with some of the best physicians, doctors concluded another surgery was necessary. Days were passing and feeding issues persisted. The best thing at that time was Valentín’s good mood. He behaved like a real superhero … it was amazing! Valentín began taking medication to improve GI motility. He started to be treated in the Intestinal Rehabilitation Unit in La Paz Hospital. After many drugs and tests, performed by those great-experienced physicians, Valentín finally began to tolerate feeding. My son was finally going to turn 1 year old at home, after 11 months being hospitalized. Living with this rare disease, his father and I have learned that every passing minute matters. Hypoglycemia can cause significant permanent brain damage. Providing information and training, both to health workers and families, might reduce the risk of neurological-damage. We want to say THANK YOU to all those people who have helped and supported us. Although there have been many different people, we want to especially thank Dr. L. Martinez Martinez and his team, for being “the most optimistic doctor in Spain”, as well as a great surgeon. Thanks also to Valentín’s “Blue Fairy”, Dr. Ana Prado, it would not have been possible without you!